In the summer of 1920, Elizabeth’s husband, Robert Holmes, died. It has been said that Robert was a drinker and violent towards Elizabeth. It has also been claimed that he met his end after falling down the steps leading up to his front door when he came home drunk one evening. Rumours abounded back then that he had some help in falling, someone (possibly Elizabeth) having deliberately given the steps an extra polish to make them slippery! Whether or not there was any truth in those rumours, Robert’s death enabled Charlie and Elizabeth to marry at last. The marriage took place very soon afterwards in the Emmanuel Church, Victoria Road, the same church in which Charlie had wed Amy thirty years earlier. The witnesses were a Mrs Fox and John Holmes, Elizabeth’s son, who was in his early twenties by then. Significantly, none of Charlie’s three sons by Amy acted as witnesses. On the marriage certificate, Charlie described himself as a general labourer and Army pensioner. 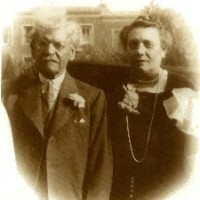 This photograph of the couple is thought to have been taken on their wedding day. Charlie was sixty-one at the time and Elizabeth forty-nine. They were living at an address in Princes Crescent, just round the corner from St John’s Road, where Charlie was brought up. After the marriage, Charlie was to live for almost another two decades. His last address was at a house in Park Place, back in the centre of Margate. As with his early years in Alkali Row and Love Lane, therefore, his final years were spent within a short walk of the sight and sound and smell of the sea. In August 1938, at the age of seventy-nine, Charlie died of kidney failure in the recently opened Margate General Hospital. The death was registered by his stepson, John Holmes, indicating perhaps that the rift between George and Thomas, the two surviving sons by Amy, and their father had never been healed. On the certificate of death, Charlie was recorded as a general labourer (retired). Thus he died as he had lived: one of Eliot’s “humble people”. In that same month, Adolf Hitler began making speeches suggesting that Nazi Germany was going to invade neighbouring countries. Another major conflict in Europe was looming; one that would have a profound effect on all of Charlie’s progeny.